As previously mentioned, the Supermarine and Vickers exhibits will be staged on the same stand, and in addition to complete aircraft the Vickers Group will show a wide range ДальшеMore>>> of equipment, instruments, armament, etc. However, it is with complete aircraft that we are chiefly concerned here. Of these, Vickers (Aviation) Limited will exhibit two machines, the very large "Victoria" troop-carrier, and a small single-seater monoplane fighter. The remaining Vickers machine to be exhibited on this stand will be an interception fighter. 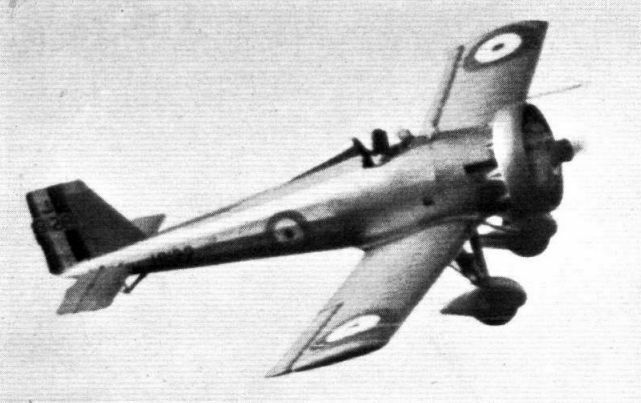 Carrying the Vickers works series number type 151, this is a low-wing monoplane of all-metal construction and fitted with a Bristol "Mercury II A" engine. As the title indicates, the type 151 is designed for intercepting enemy aircraft at a great altitude, and this necessitates not only a phenomenal rate of climb but also a very high-speed at 20,000 ft. or more. The Bristol "Mercury II A" engine is supercharged in order to maintain its power at altitudes. Performance figures of the Vickers 151 cannot be given, but it is permissible to point out that in its construction duralumin is largely used, even to the wing covering which is of this material. Incidentally, the Vickers interception fighter will be the only British aircraft at Olympia to have metal wing covering. The details of the construction have already been dealt with in FLIGHT to some considerable extent, although not as referring to this particular machine. It may be recalled that the duralumin sheet wing covering is applied to the duralumin internal wing structure by the patented Vickers-Wibault process. 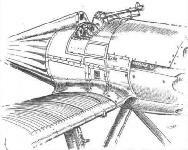 The fuselage is also entirely of metal (duralumin) construction, and the machine is designed to carry two Vickers' guns as its armament. The undercarriage is provided with hydraulically-operated wheel brakes of the Vickers' patented type, which has previously been described in FLIGHT. 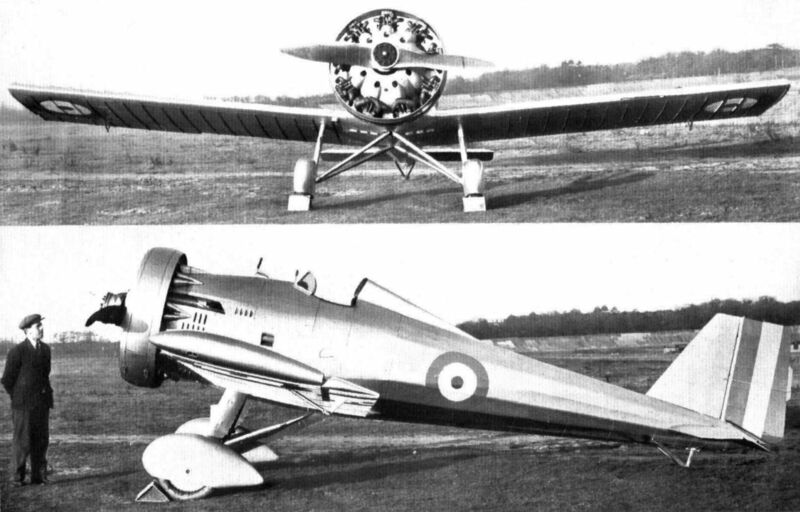 IN the competition for interceptor single-seater fighters held a couple of years ago the Vickers machine entered did not succeed in gaining first place, and probably most people have by now forgotten that there was a Vickers monoplane in the competition. Thus when they hear of the Vickers interceptor fighter they associate the title with the machine of some years ago. 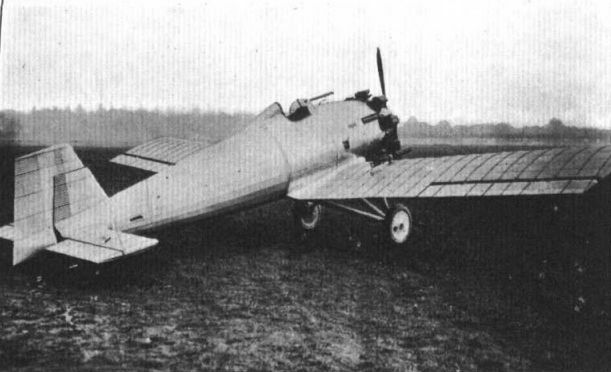 It is not until quite recently that the aviation community in general has realised that in the meantime Vickers (Aviation), Ltd., have been working away quietly on the problems connected with this class of aircraft, and have produced a machine which, although superficially bearing some resemblance to the earlier type, is in reality a totally new aircraft. For instance, the fuselage is characterised by a very slender outline with a straight taper from cockpit to stern post. The cantilever wings, placed low on the body, are carefully faired into the fuselage form so as to avoid interference drag, and a Townend ring has been placed around the Bristol "Mercury" engine to reduce drag. Altogether the very greatest care has been taken in "cleaning up" the machine, and the results seem to justify the means, since the machine we illustrate this week is probably the fastest single-seater fighter in the world. The performance figures show the machine to have a maximum speed at altitude of but little short of 240 m.p.h.! Apart from the generally clean aerodynamic design, this high speed is partly to be attributed to a very high wing loading (21.8 lb./sq. ft.). This is probably the highest wing loading ever adopted by a British designer for a service aircraft, and the landing speed is necessarily high (some 62 m.p.h. at zero altitude). It might have been thought that the climb would suffer somewhat from such high wing loading, but, in point of fact, the altitude of 20,000 ft. is reached in less than 11 minutes (under ideal weather conditions), so that the climb could scarcely be termed inferior. The absolute ceiling, too, is high, some 36,000 ft., and altogether the new Vickers interceptor appears to be a rather formidable piece of apparatus. The duration at cruising speed is a little over 1 1/2 hours, probably sufficient for reaching the altitude of 13,000 ft. and then cruising there, or a little higher for 1 1/2 hours. The engine fitted is a Bristol "Mercury," series IV S.2, which develops 530 b.h.p. at 2,600 r.p.m. and 15,800 ft. This engine is geared as well as super charged, the gear ratio being 0.656:1. From the front view it will be seen that the Fairey metal airscrew is not, in spite of the gearing, of particularly large diameter, so that the undercarriage is fairly low and drag somewhat reduced. The Vickers "Jockey," as the new machine is named, is of all-metal construction, the expression "all-metal" being in this case used in its proper sense, as the only parts of the machine not covered with metal are the tail surfaces. In the wing and fuselage the covering is of duralumin, and is part of the stress-bearing structure. Wings. - The monoplane cantilever wing has spars of duralumin (box section), built up and joined by riveting, while the ribs are tubular and the various members joined together by plates and riveting. The covering is, as already stated, of duralumin sheet, and is of the patented Wibault type, the British rights for which are held by Vickers (Aviation), Ltd. The ailerons are, like the wing, covered with duralumin sheet. The wings are of R.A.F. 34 section. Tail Surfaces. - Fin, tailplane, rudder and elevators are built up of duralumin tube, and fabric covered. Trimming gear is provided whereby the tailplane can be set to any desired angle for flying horizontally at any speed within the machine's speed range. Fuselage. - Two forms of construction are employed in the fuselage structure. The front portion is of steel tube construction, with aluminium panel covering. The rear part is of monocoque construction, duralumin angle sections being used for the framework and sheet duralumin for the covering. Undercarriage. - Of the divided type, the undercarriage has struts of steel tube, with bent axles of high tensile steel. Springing is by Vickers oleo-pneumatic units, and as the oil used is of the non-freezing kind, these units can be used in temperatures as low as 30 deg. C. below zero. Wheel brakes are fitted, and are of the Vickers patented hydraulic type, capable of being operated independently for purposes of steering the machine on the ground. An all-metal tail skid is provided, springing being by means of rubber blocks in compression. Engine Installation. - The Bristol "Mercury" engine is supported on a hinged mounting, consisting of a duralumin plate carried on steel-tube struts. The petrol is carried in welded aluminium tanks, the main tanks being in the wings and the service tank in the deck of the fuselage. The total tank capacity is 62.5 galls. (284 litres), but normally the tanks are not filled to capacity. When more than 51 gallons (232 litres) of petrol is carried, the military load must be correspondingly reduced. The total oil capacity is 7.5 gallons (34 litres), but for normal duration only 5 gallons (23 litres) is carried. The fuel is pumped from the main to the service tank, but from there it flows by force of gravity to the engine. A hand pump is provided for emergencies. Cockpit. - The cockpit is, of course, of the open type, and is equipped with the usual instruments, armaments, etc., in addition to the flight controls. The instrument board contains the following :- Air speed indicator, lateral inclinometer, oil thermometer, altimeter, watch, compass, revs, counter, and oil pressure gauge. The standard armament consists of two Vickers .303 belt-feed guns firing "through" the propeller, the usual interrupter gear being fitted. Quantity Item Weight. kg. lb. As the permissible military load (with 51 galls, of fuel) is 371 lb., this list does not exhaust the equipment that can be carried within the machine's Acrobatic Certificate of Airworthiness, which is for a gross weight of 3,270 lb. (1 486 kg.). 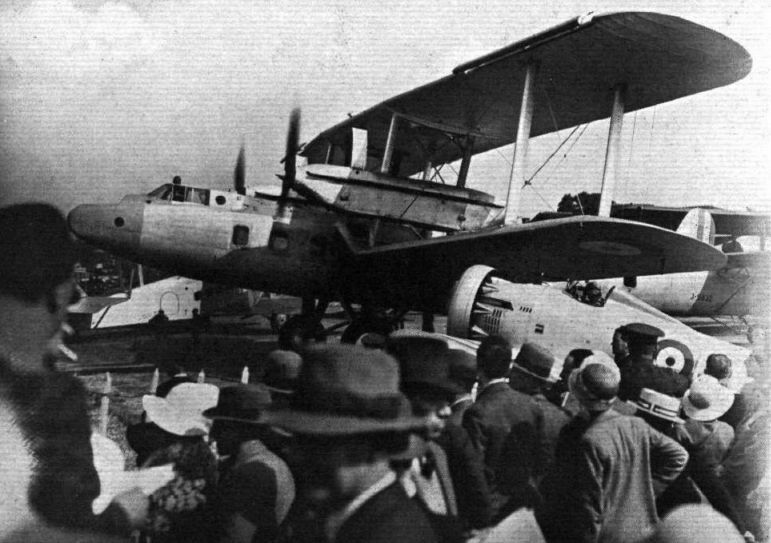 ALTHOUGH the machines for which Vickers (Aviation), Ltd., are generally known throughout the world are probably mostly their heavy long-distance night bombers, of which the firm has supplied large numbers to the R.A.F., the firm has produced a great many other types, several of which have gained fame abroad. Of the many types produced we have space here to deal with but a very few. It might be recalled, however, that a Vickers "Vespa" (Bristol Pegasus engine) holds the world's altitude record (pilot. C. F. Uwins, of the Bristol Company) of 13,404 m. (43,976 ft.). Dignity and impudence are personified, on the Vickers stand, by the "Victoria" troop-carrier and the single-seater interception fighter. DIGNITY AND IMPUDENCE: The Gloster Troop Carrier and the Vickers "Jockey" emerging from the aircraft park. VICKERS "JOCKEY" ("Jupiter VII F"). THE VICKERS "JOCKEY" INTERCEPTOR FIGHTER: Clean aerodynamic design, high wing loading and low power loading have between then achieved outstanding performance. The maximum speed is nearly 240 m.p.h.! The wing roots on the Vickers single-seater fighter are carefully faired into the fuselage. Note the very unobstructed view for firing.